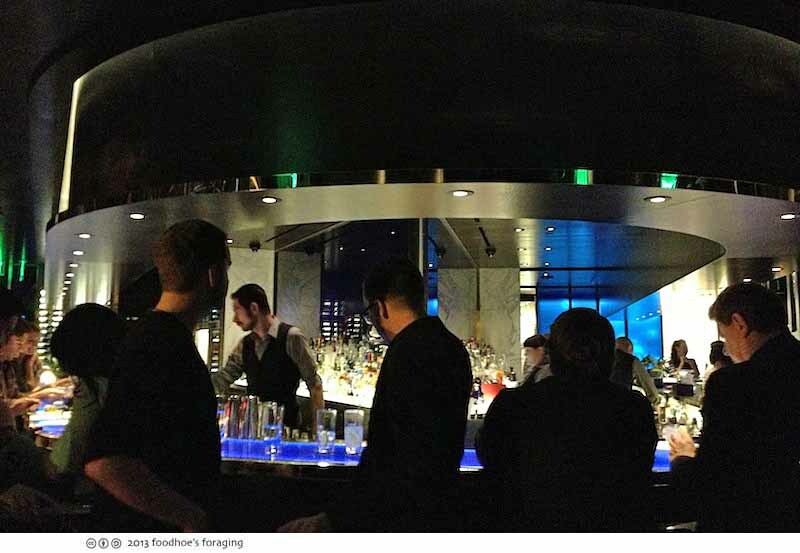 I met friends Jaytee, Daisy and P at this beautiful new restaurant which opened recently above a bank in downtown SF. 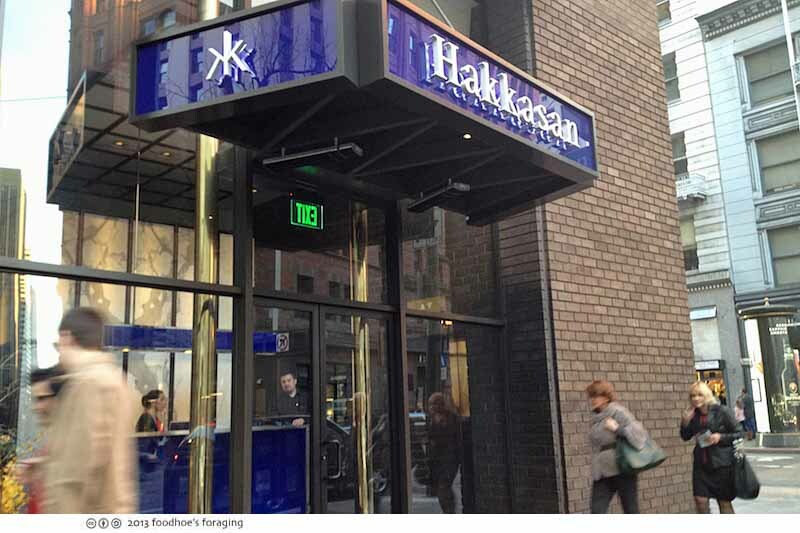 I read that Hakkasan is owned by an Abu Dhabi–based company that spent $7 million to create the swanky, sleek restaurant with a distinctly Asian motif that serves high-end Chinese food with prices that are even higher than Slanted Door. 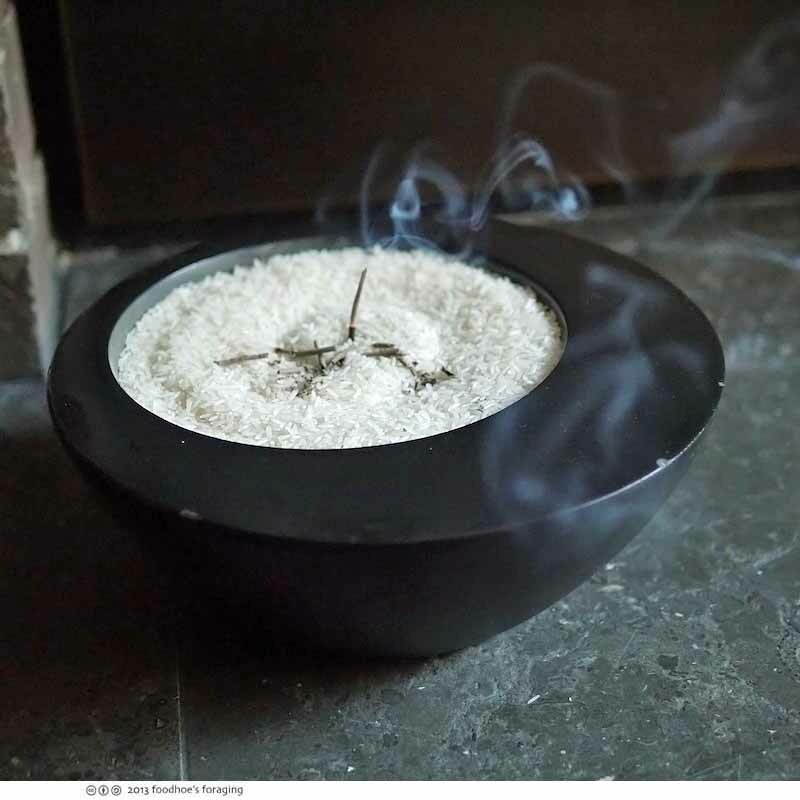 The first thing you notice when you enter the lobby is the fragrance of incense, which reminds me of entering a temple and it greets you again when you exit the elevator to the 2nd floor restaurant. I walked down a hallway into a reception area where I checked in and was led past a shiny blue bar which forms the focal point of the space. The space is broken up with dramatic bold screens and theatrical lighting which made the space feel intimate. 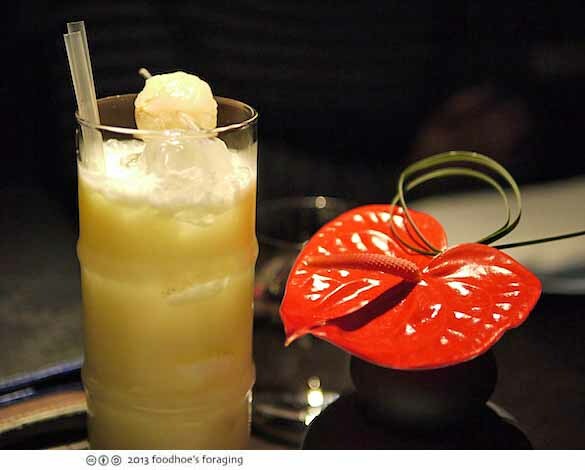 Here is Daisy’s Hakka cocktail ($16), which combines Grey Goose vodka, sake, coconut milk, lychee juice and fresh passion fruit and garnished with plump, fresh lychees. Our first plate was the Hakka Fried Dim Sum platter ($28) which certainly was gorgeous to look at. 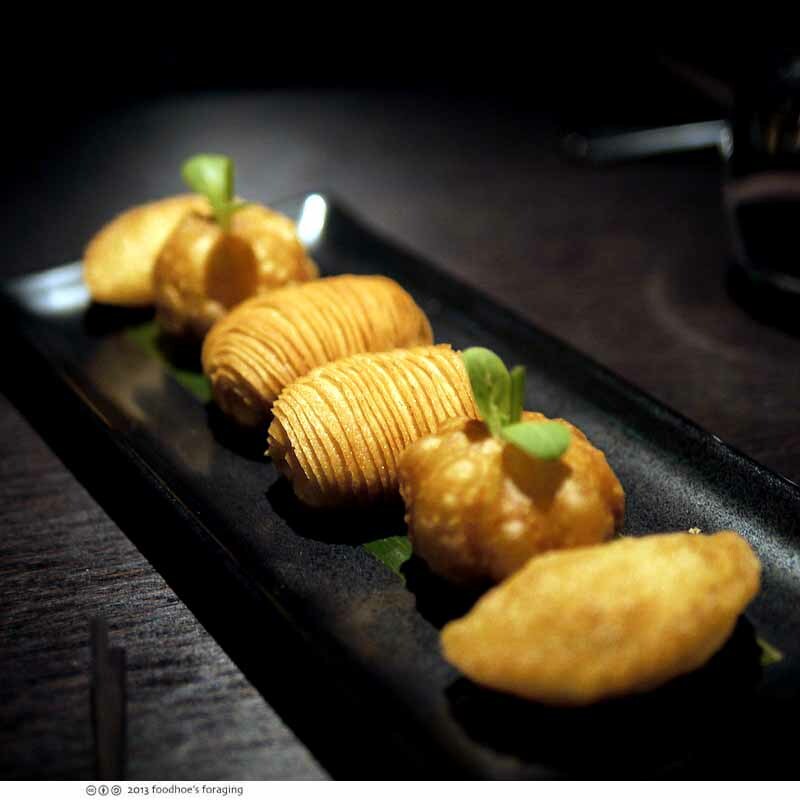 Two each (from the center) of XO scallop puff, roasted duck and pumpkin puff, and crispy prawn dumplings. Each was exquisitely made, ethereal and delicately flaky crusts filled with tender morsels in savory sauces. 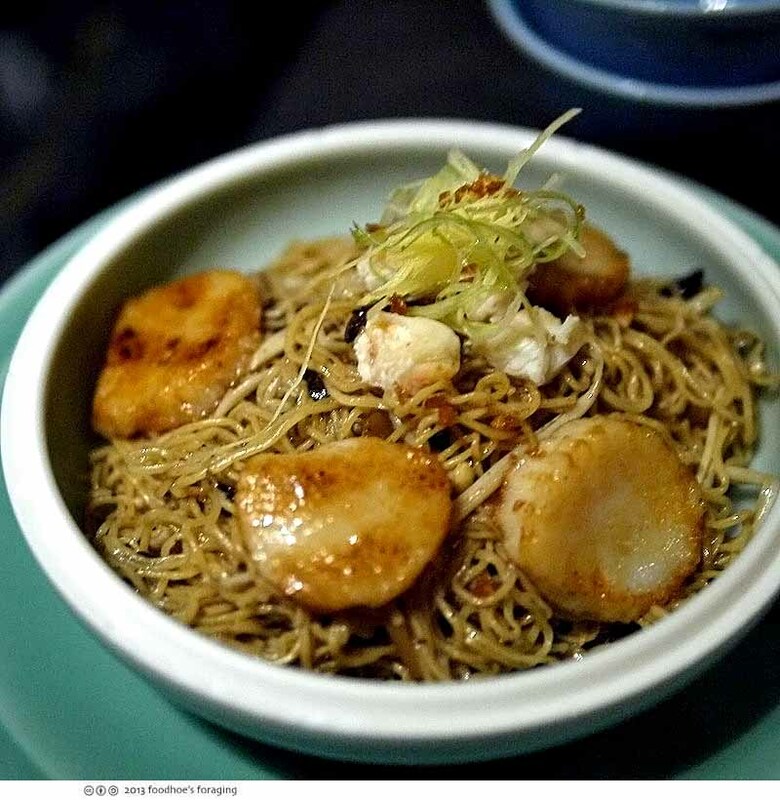 I wished we had also ordered the steamed platter as well, but that can wait for another visit! The Roasted Silver Cod with Champagne and Chinese honey sauce ($39) is one of their signature dishes but pricy for the size, which seemed to be a weight watchers portion… We enjoyed the beautifully crisped exterior which encased the tender juicy flesh, a simple dish with rich, complex flavors and textures. 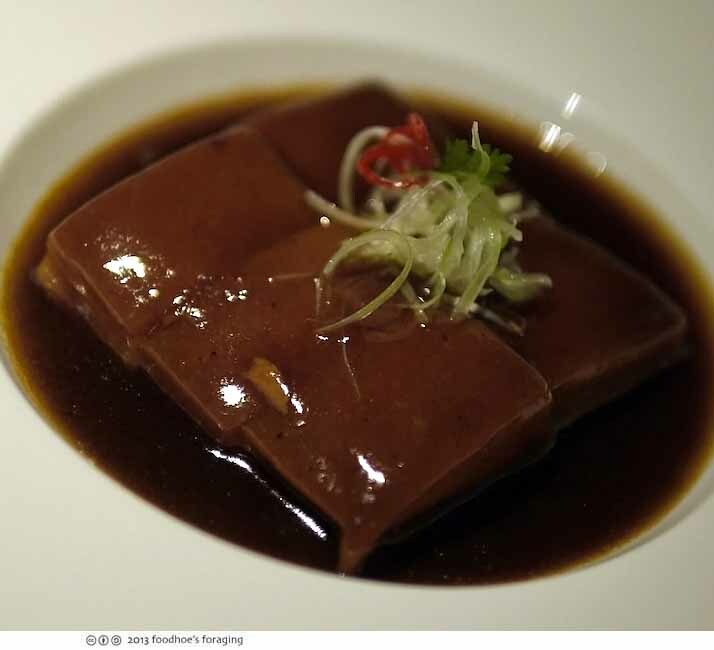 The Braised Pork Belly with aged vinegar sauce ($19) was cooked long and slow until very tender, it was like pork custard and practically melted in your mouth. No knives needed here! 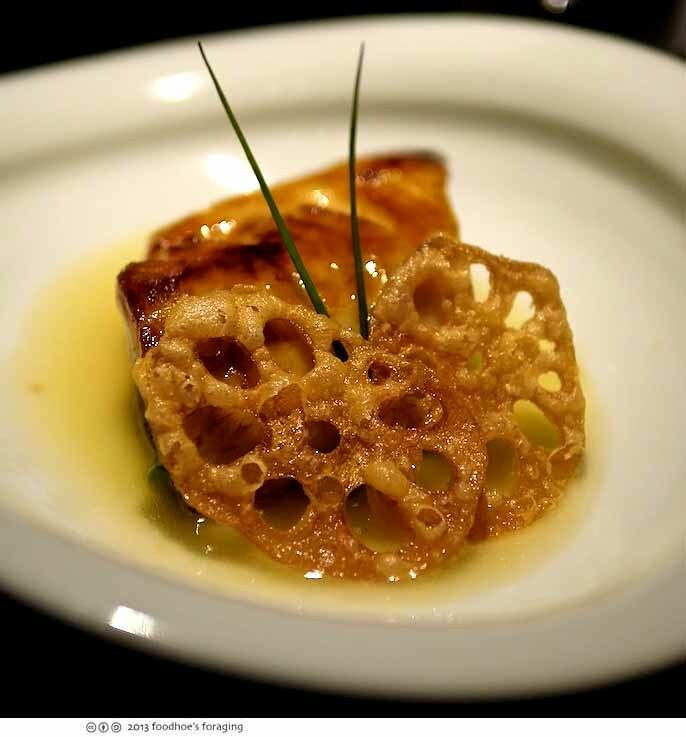 This was served with three petite steamed buns which were very good dunked into the various sauces. They brought us another round with the next course too. 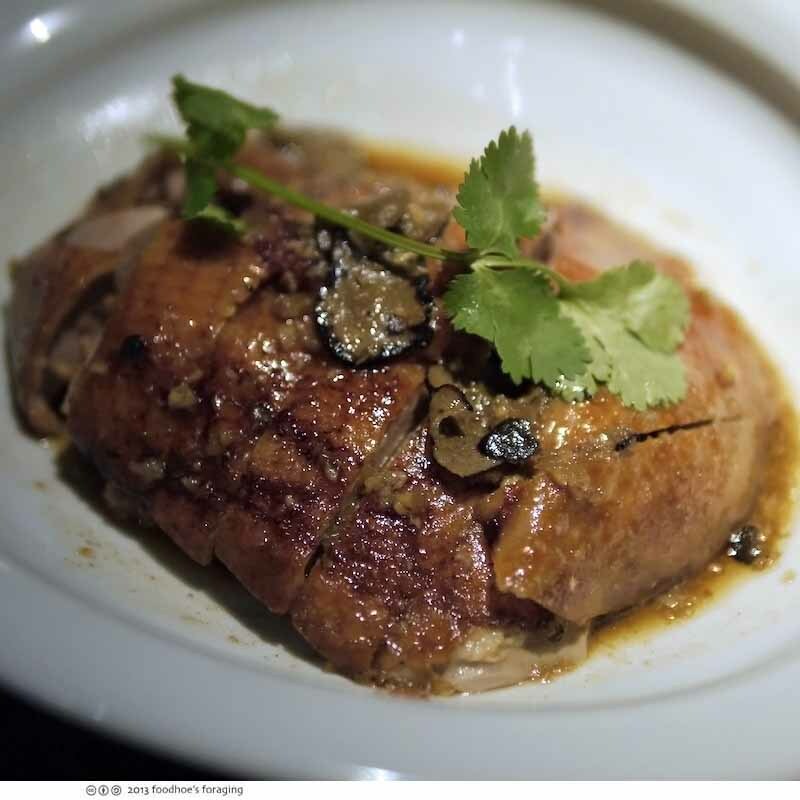 The Black truffle roasted duck ($48) was aromatic and delicious, but didn’t have the crispy skin as described by our server. It was tasty in the manner of roasted duck with the alluring fragrance from the truffles, but was disappointingly lacking in the texture department. 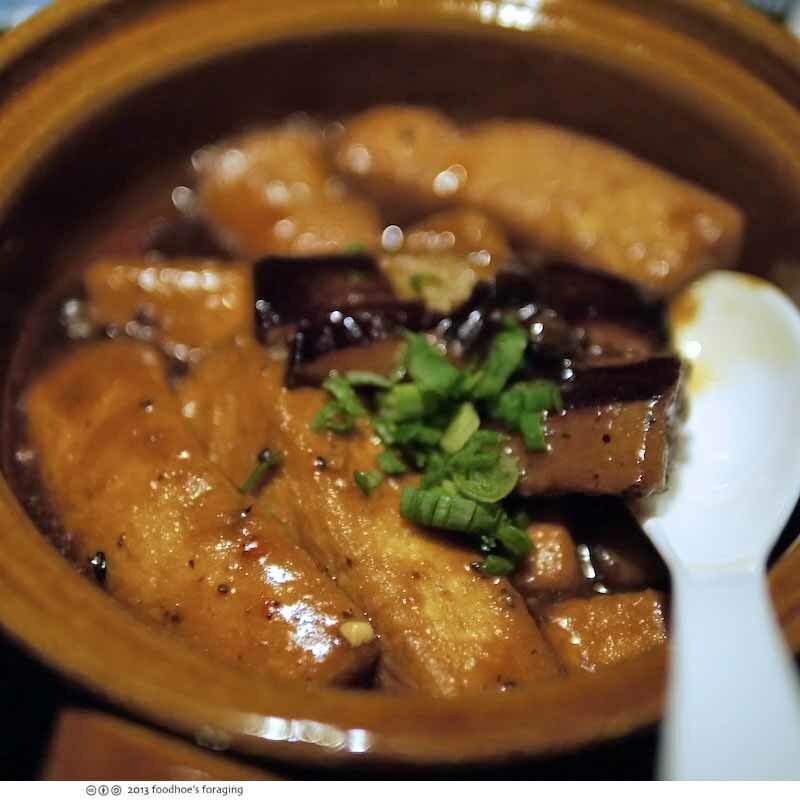 Tofu, eggplant and shiitake mushroom claypot in chili black bean sauce ($12) was filled with thick slices of velvety tender eggplant and fried tofu that were infused with flavor from the savory sauce and mushrooms. 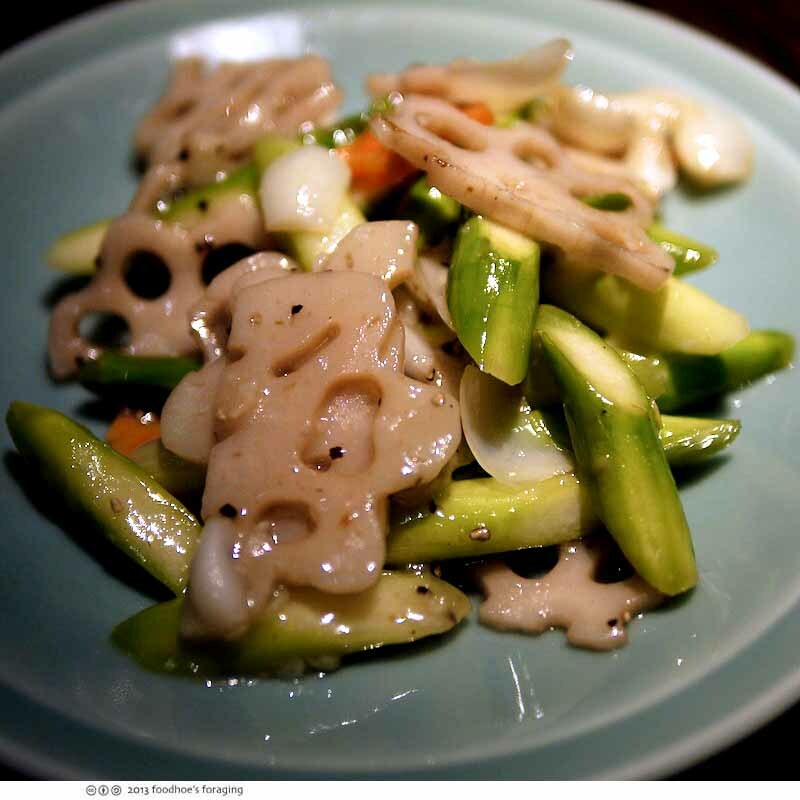 One of bright spots of the evening was the Stir-fry lotus root, asparagus and lily bulb with black pepper ($12), thin slices of lotus root that formed elegant lacy rings, everything was fresh and crisp and seasoned very well. 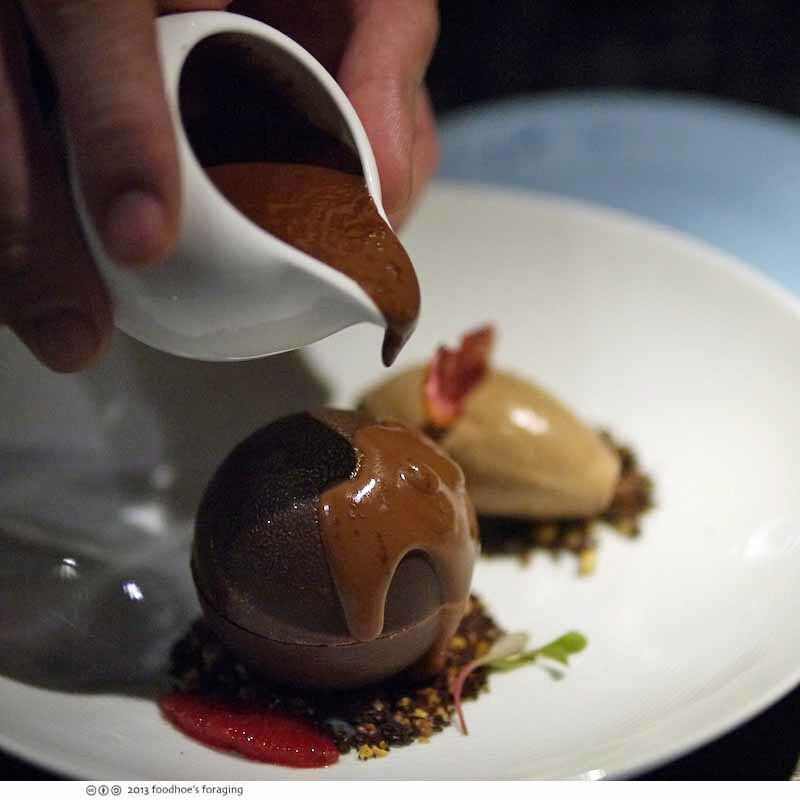 Chocolate Orange ball ($10), was a dramatic tableside presentation where the waiter pours warm chocolate onto a hollow chocolate ball that melts to reveal a mousse inside sprinkled with poprocks. Served with a scoop of gianduja ice cream and a thin lacy slice of dehydrated blood orange. Rich and deliciously chocolatey. 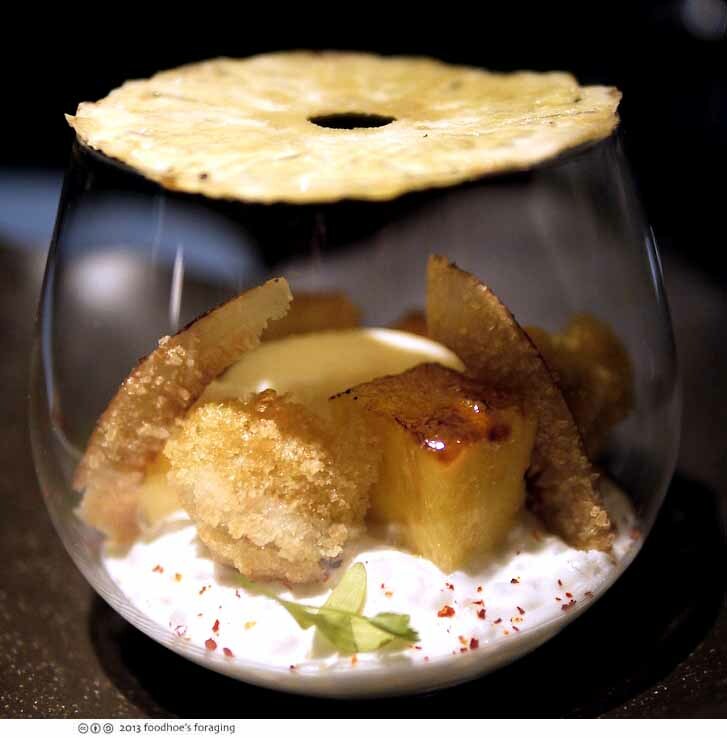 Coconut Tapioca Pudding ($10) with chunks of caramelized spiced pineapple, served in a round glass bowl that looked like a frilly terrarium, topped with a delightfully chewy disk of dried pineapple. Both desserts we shared were very good and memorable. 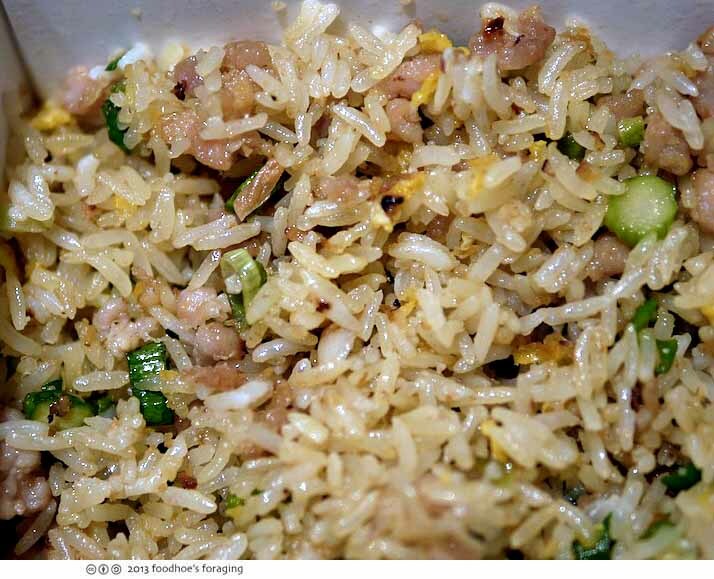 I asked our server if I could order something to go for Mr. K (who worked late and got stuck in traffic), and was told that while they don’t have food to go, he’d bring our order of fried rice with a doggie bag for the leftovers. Here is the Chicken fried rice with salted fish ($10) which smelled fantastic on the train ride home and which Mr. K greatly enjoyed later that night. I enjoyed our meal, it’s a nice spot to hang out at. The service was really good in the beginning, although it was harder to get attention as the evening progressed, but they were always very courteous. 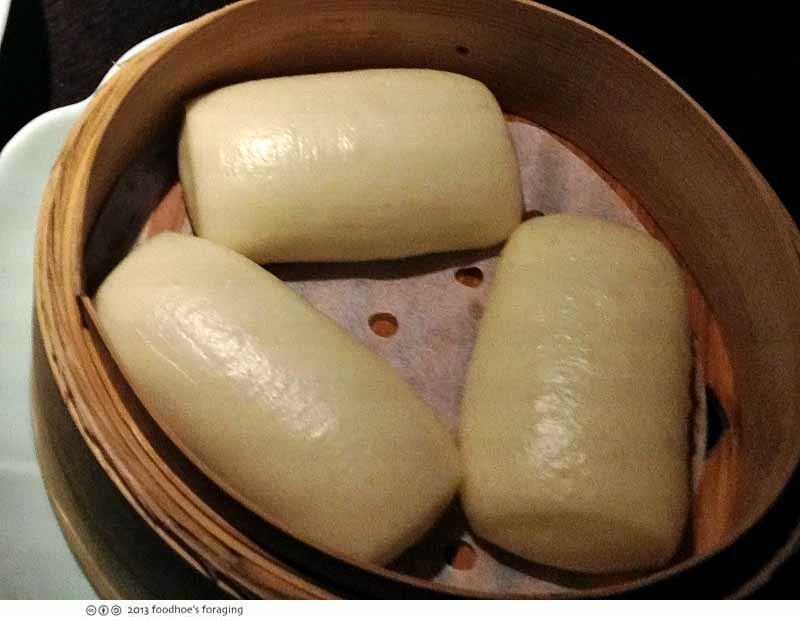 The prices are high, especially for the dimsum, which was interesting enough that I’d go back just to explore that part of the menu exclusively and skip the horrendously expensive signature dishes. A nice and atmospheric place! The food looks lovely. Those fried dim sum are very pretty. Pretty! Too pricey for me but I might have a go at the chocolate ball. Jane the desserts were very affordable and delicious! Looks like very thoughtful delicious Chinese food. I wonder if the soon to be open Hakkasan here will be as good? I bet it will be even swankier! I liked the food, the prices not so much… although I’m thinking about checking them out for lunch which I think has more dimsum choices. Beautiful pictures and we are glad you liked the experience. 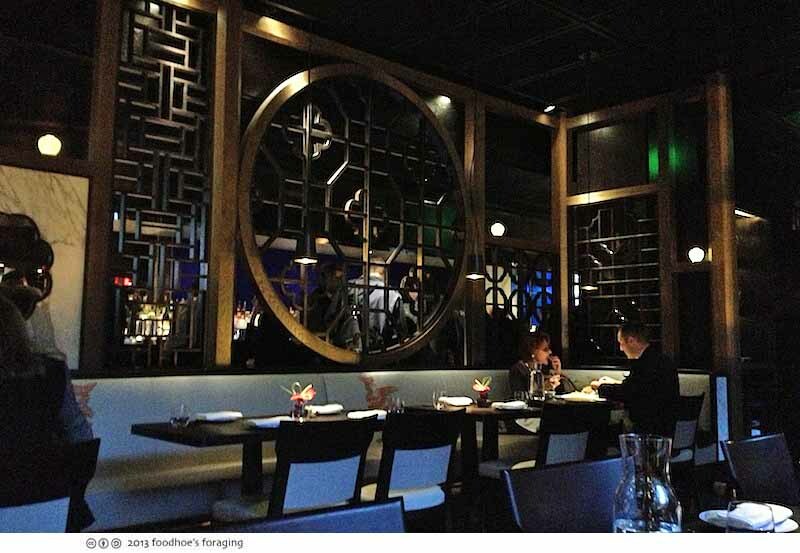 Many of the big reviewers panned Hakkasan. This is one of the few swanky Chinese restaurants around here. It is expensive but good for special occasions. I enjoyed reading your food blog and wanted see if you’d like discounted tickets to my magic and dinner show. It’s a 10 course Chinese banquet meal with an amazing magic show. Below are the links to the show. I’ve also included a discount code for your readers if you’d like to share this innovative show with them. Use “direct” at checkout to get 50% off regular priced Dinner Show tickets.